Pokemon, which began as a video game, first came out in 1996 and drew in crowds of fanatic, cult followers. Twenty years later, it once again exploded with the release of its latest version, a smart phone based version called Pokemon Go. Using a technology known as Augmented Reality (AR), this new version allows users to play and interact with the game in a ‘real-world’ environment. Using the smart phone’s camera and GPS maps, augmented reality layers the game world on top of the real one. This means that fans can finally catch Pidgeys and Pikachus in the comfort of their own home. These days, you don’t have to be the game hero, Ash Ketchum, to be obsessed with ‘catching them all’. 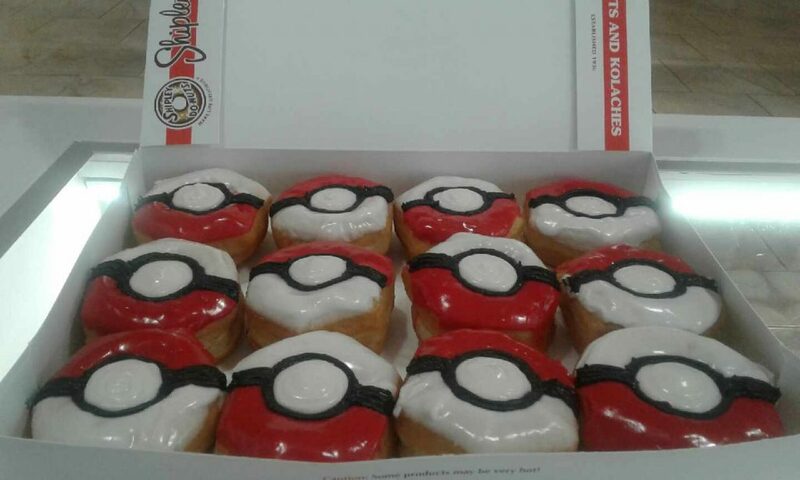 With even large retail chains, such as Target, getting in on the craze, it’s hardly a surprise to see Pokeball Pokemon Donuts at your local Shipleys. Why Do Kids Love Our Pokemon Donuts? Fact #1: Kids love donuts. Fact #2: Kids love Pokemon. Our ‘scientific’ observation: Kids love Pokemon Donuts. It’s true, nothing lights up a kids face these days (big kids, too), as the discovery of Pokeball Pokemon Donuts at our two Houston locations. Plus, with our West Houston location open 24 hours a day, you can satisfy your craving for Pokemon and doughnuts at the exact same time, anytime! While kids run around our city catching as many Pikachus, Butterfrees, and Crabbies as they can, we can provide them the fuel and energy to run around all day. Whether you prefer Ivysaurs or Wartortles, Charmeleons or Hawluchas, everyone can enjoy a delicious Pokeball Pokemon Donut. They don’t just help you feel like a real Trainer, but they help you look like one too. If you want to try our new Pokeball Pokemon donuts, come by one of our two Houston locations (West Houston and Downtown) and give them a try. Give us a call (713) 589-3292 or order online for store pick up or delivery. See why the kids are going nuts for our Pokeball Pokemon Donuts today. These eye-catching cult-icons won’t be around long, so come by and catch ’em while you can. Most of whatever you articulate happens to be astonishingly precise and it makes me wonder the reason why I had not looked at this in this light previously. Your piece truly did switch the light on for me personally as far as this topic goes. Nevertheless there is actually 1 point I am not too comfortable with so whilst I attempt to reconcile that with the central theme of your point, let me observe just what all the rest of your subscribers have to point out.Nicely done. Your mode of explaining everything in this paragraph is actually pleasant, all can simply be aware of it, Thanks a lot. listen news on TV, therefore I just use internet for that reason, and get the most recent news.